The World's Oldest Commissioned Naval Vessel Still Afloat Is The? 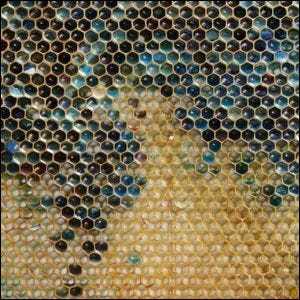 In the summer of 2012, French bee keepers were alarmed to discover their hives filled with startlingly colored honey. Comb after comb was discovered to be filled with brilliant blue, green, red, and yellow honey; all shades far too removed from the simple amber sunshine-like hue one would expect from freshly gathered honey. An investigation into the matter revealed that the honey was entirely unadulterated, except for the presence of food grade dyes. Specifically, the food grade dyes used to color candies and soda. Further investigation revealed that the source of the dye was a nearby M&M chocolate factory. The clever bees had somehow found their way into the waste stream produced by the factory and were happily (albeit lazily) scooping up as much of the brightly colored sugar waste as possible.